T-Mobile today officially announced that both of its upcoming LG phones will be available to buy from February 5th. Both the LG G Flex and Optimus F3Q will be released on the same day. LG’s G Flex is the most notable here, mostly due to its gigantic 6-inch curved OLED display. It also features a 13MP camera and a 3,500mAH battery. Like the G2, it also has the built-in Rear Key for convenience. As for pricing, it’s going to be $0 down with 24 monthly payments of $28, taking it to $672 in total plus T-Mobile’s Simple Choice Plan. But that’s not all, anyone buying the LG G Flex on T-Mobile will also be able to take advantage of an exclusive Netflix offer. 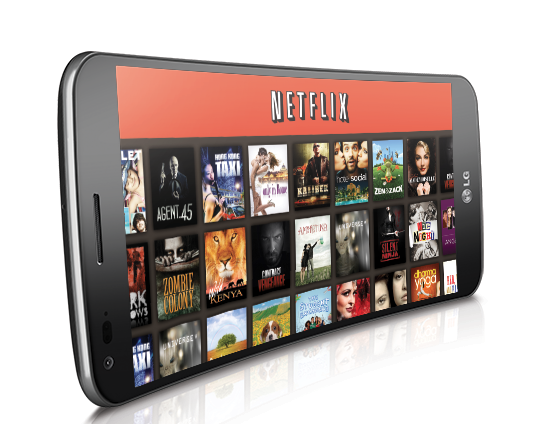 Buyers will be receive 6 months of Netflix for free (usually $7.99 per month for the unlimited streaming plan). To qualify for the offer, customers will need to buy a G Flex between February 5th and April 30th. Further details are available here. Pre-orders for the G Flex begin today. To check it out in more detail, or to pre-order, head on over to the product page on T-Mobile’s site. As for the horizontal slider, QWERTY-equipped Optimus F3Q, there won’t be any pre-orders. It’s being marketed as a mid to low-end device. But for those of you who miss the days of the T-Mobile G1 and G2, and haven’t been able to cope with the disappearance of physical keyboards, this might just be the only option available. It features a 4-inch screen and a 5MP camera and won’t cost the earth. Like the G Flex, it’s $0 down, but will only cost $13 per month on EIP. That’s a total of $312. To read the full press release on the latest LG phones from T-Mobile, head on over to the Newsroom. My eye is on Sony Xperia Z2, also the Lg flex g is running 4.2.2 and only 2gb of ram which seems dated to me. Yep, waiting on the Sirius too. This will give me something new to play with until then. I am actually looking forward to “downgrading” back to 4.2.2. Once I upgraded my XZ1 to 4.3 I lost the ability to use my (free) hotspot with my smart tv. A quick Google search told me that it was common. You don’t need a new one. So what other phones are you liking hoping to get by my retail outlet to get some hands on time with the Z1 this week. You are correct, I don’t need a new one but….. :) Nail polish and phones are my only vices in life. Could be much worse! Besides, since I’m utilizing JUMP! it’d be stupid of me not to. So far this is the only one I have my eye on and mainly because it’s different. I’m really enjoying my Z1 (I have the Z1, not the Z1S that T-Mobile is offering). So far, I’m liking the specs of the Xperia Sirius (Z2) so I’m patiently waiting to see when it’ll be released. I’m not loyal to any one manufacturer so who knows what will happen between now and then. So what if anything is different between the Z1 and Z1S? I kinda what to see what HTC has up their sleeves. Tired of Samsung. I really would love a slider with physical keyboard and a bigger screen. But those aren’t very popular. Other than the headphone jack being in a different location, I got 16GB and you get 32GB. :) Everything else is the same. You’re not interested in the F3Q? I am but I will need to see it and play with it in store. No real spec difference between the too. Camera is only a 5MP like the relay. Looking at reviews on the Z1S is the volume control buggy? 4.2.2 may be a little dated, but considering there is currently only one smartphone on the market with 3GB of RAM, I wouldn’t call 2GB dated. It’s definitely more than enough for most people’s needs. That being said & considering I own that one phone with the 3GB of RAM, I would never go back to a phone with less. EDIT: By “the market”, I should specify that I mean the North American market. What phone do you have if you don’t mind sharing. No no no no no lol. I’ll take the Samsung Galaxy S Relay 4G for about $170 new on eBay and save about $140. Love my relay just wish it had a bigger screen. It will get no love beyond the 4.2 it is currently at either. These prices explain why ATT and Verizon cost so much. $600 for a phone is idiotic. Agreed 100%. A decently spec’d laptop can be had for about that much. you’ll pay that much no matter who you go with. if anyone’s to blame it’s apple, samsung and phone makers who make the prices high. people need to understand: the phones are crazy expensive no matter where you get them. It just seems like TMO is more because they’re the only transparent ones. Let me guess, You want more features, Battery life, Display and function. But only want to pay bottom Dollar? Why would you want to pay MORE?? Consumers like you ruin it for everyone. Learn to demand more from companies not less. Never settle. If they give you dual-core for $1, demand quad-core for $0.50. Make them EARN your money. The hell is wrong with you? I can buy a computer for $600. I can make 2 car payments. I could eat for months. I could pay rent. $672 is pricey. What you all think? Actually the total price of the phone will be $576. I’ll stick with my G2 & IPS display. Those OLED displays have that Samsungy blue-ish tint to them i dont like.